On a visit to lake Bogoria to photograph the flamingos and try to spot some greater Kudu, my wife found this scorpion next to our cool box during our picnic. I grabbed my camera and macro lens and managed only 3 shots before the scorpion went back into its hole. 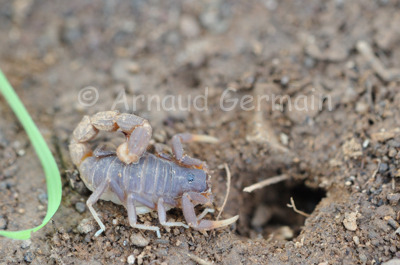 It is quite unusual to see a scorpion out and about at midday as they tend to be nocturnal. To tell if a species of scorpion is highly poisonous, you must look at the pincers: if they are big and thick, the sting is not too bad. If they are narrow and thin, then you do not want to be stung. This one had thin pincers so I did not bother him! Nikon D700, Nikon 85mm macro lens, F6.3, 1/60s, ISO 400, handheld. Lake Bogoria, by the hot springs, Kenya.